London / Edinburgh / Glasgow: Matthew Iley, Somerset Street / Bell and Bradfute; W. Blackwood / W. Turnbull, 1821. First Edition. Morocco. Near Fine+. First Edition. Tall 8vo: ,251,pp, with 20 leaves of hand-colored aquatints by William Read and C. Williams (after, but not by, Rowlandson, as often asserted). Text in verse. 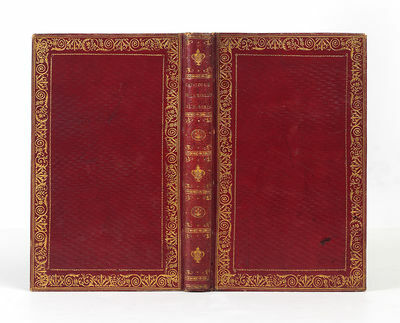 Contemporary red straight-grained morocco, covers bordered in blind and in gilt, richly gilt spine in six compartments, gilt turn-ins, red morocco lettering piece gilt, all edges gilt, period plain brown end papers. An excellent example of a handsome production, with marginal stains on paste downs from binder's glue and light offsetting from plates onto opposing pages, otherwise clean, bright, and unmarked. Tooley 433. Abbey, Life, 277. Prideaux, p. 334. Hardie, pp 168, 317. One of a "host of parodies and spurious imitations" (Hardie) of William Combe's series of Doctor Syntax books, and sometimes attributed to him (as well as to Rowlandson). Some of the incidents depicted are similar to those described in Boswell's Journal of a Tour to the Hebrides, with Samuel Johnson, and it may have been inspired by that book. N. B. With few exceptions (always identified), we only stock books in exceptional condition. All orders are packaged with care and posted promptly. Satisfaction guaranteed. Travels in Palestine, through the countries of Bashan and Gilead . - Plate XVII: 'Kestril - Male.' This plate shows a male Kestrel. Copperplate engraving / etching on a vellin type paper with original hand colouring. 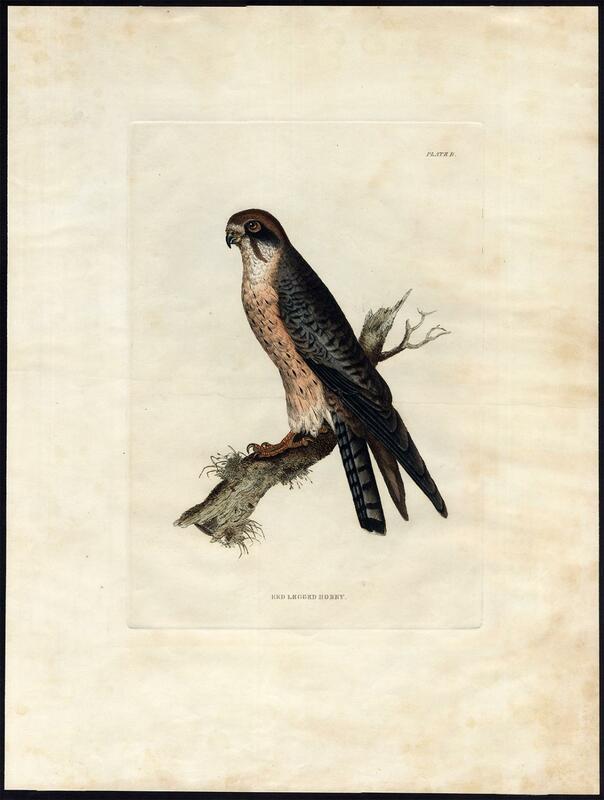 Description: This rare original antique print originates from 'Illustrations of Ornithology. London' by John Selby published 1821-1834. Imperial folio.Artists and Engravers: Prideaux John Selby (1788 - 1867) is often called the British Audubon, for his magnificent work, Illustrations of Ornithology, was the first British natural history to render all its subjects in their exact life size, as Audubons was the first to do so for American birds. The connection actually goes deeper, for in 1826 Selby took lessons in technique from Audubon in Edinburgh, and this is evidenced in the marvelous skill with which Selby portrayed his subjects. In depicting the birds in their life size, Selby produced prints of a larger size than any other prints of the period than those of Audubon, whose prints followed shortly. Selby employed the best British engravers and colorists of the time, and the large size of the prints allowed the most advantageous display of the fine work for which these prints are known. Finely engraved, accurate in detail, wonderfully colored, and strong and dramatic in appearance, Selbys prints are some of the best figures of British birds that have ever been published. (C.E. Jackson, Bird Illustrators, p.33). Condition: Good. General age-related toning and light staining/soiling from handling as visible on image. Light foxing and some spots, mainly in the margins. Please study scan carefully. Storage location: DP-P5-09 The overall size is ca. 19.3 x 24.4 inch. The image size is ca. 10.6 x 16.1 inch. The overall size is ca. 49 x 62 cm. The image size is ca. 27 x 41 cm. - Plate B: 'Red Legged Hobby.' 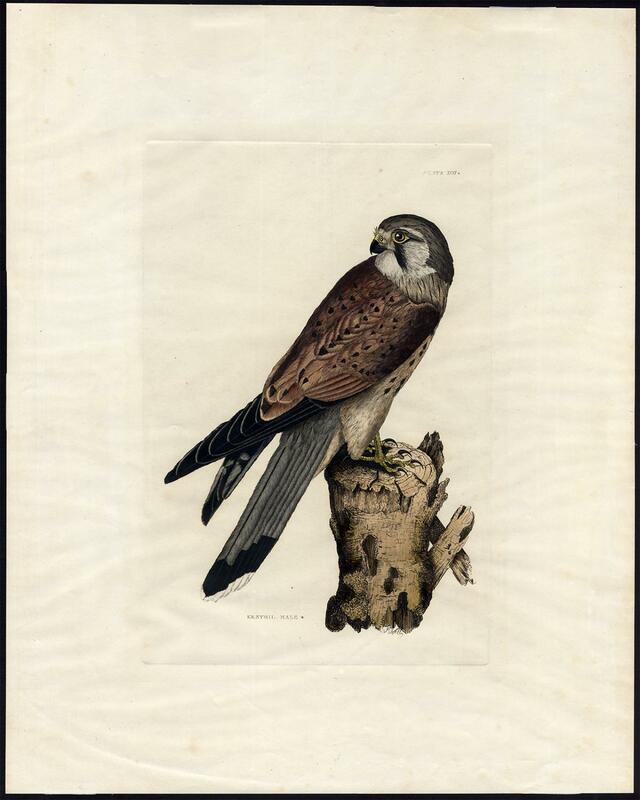 This plate shows the Red-footed Falcon (Falco vespertinus). Copperplate engraving / etching on a vellin type paper with original hand colouring. 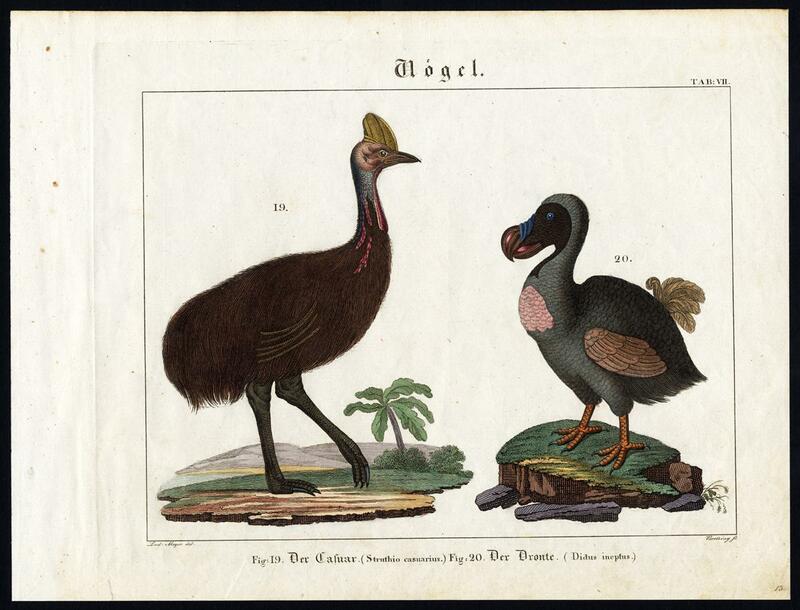 Description: This rare original antique print originates from 'Illustrations of Ornithology. London' by John Selby published 1821-1834. Imperial folio.Artists and Engravers: Prideaux John Selby (1788 - 1867) is often called the British Audubon, for his magnificent work, Illustrations of Ornithology, was the first British natural history to render all its subjects in their exact life size, as Audubons was the first to do so for American birds. The connection actually goes deeper, for in 1826 Selby took lessons in technique from Audubon in Edinburgh, and this is evidenced in the marvelous skill with which Selby portrayed his subjects. In depicting the birds in their life size, Selby produced prints of a larger size than any other prints of the period than those of Audubon, whose prints followed shortly. Selby employed the best British engravers and colorists of the time, and the large size of the prints allowed the most advantageous display of the fine work for which these prints are known. Finely engraved, accurate in detail, wonderfully colored, and strong and dramatic in appearance, Selbys prints are some of the best figures of British birds that have ever been published. (C.E. Jackson, Bird Illustrators, p.33). Condition: Good. Paper slightly browned and light staining/soiling from handling as visible on image. Paper slightly browned at places. Light horizontal crease. Please study scan carefully. Storage location: DP-P5-09 The overall size is ca. 18.1 x 24.4 inch. The image size is ca. 10.8 x 15.7 inch. The overall size is ca. 46 x 62 cm. The image size is ca. 27.5 x 40 cm. - Plate VII: 'Vogel. (Birds) 19. Der Casuar (Cassowary) 20. Der Dronte (Dodo, Raphus cucullatus). Etching and engraving on a vellin type paper. Original hand colouring. 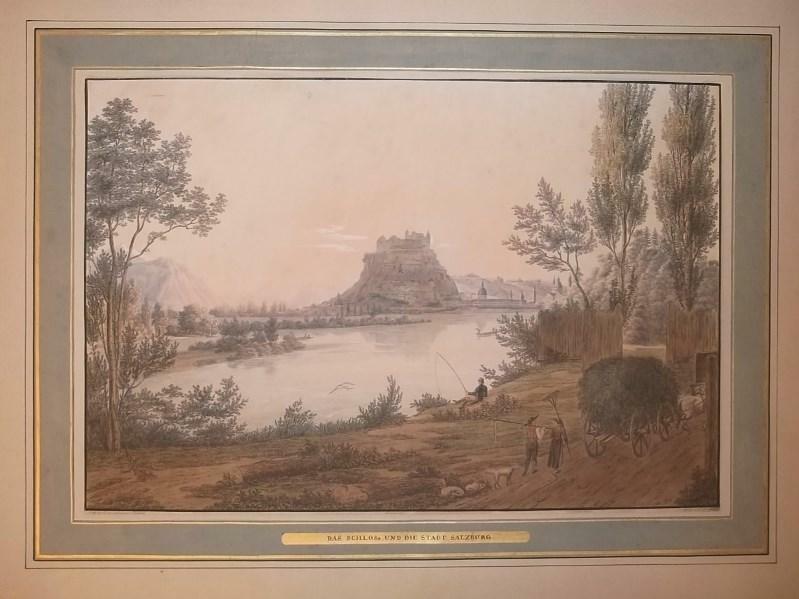 Description: This rare attractive original old antique print / plate originates from: 'Kupfer-Sammlung besonders zu F. P. Wilmsens Handbuch der Naturgeschichte fï¿½r die Jugend und ihre Lehrer, aber auch zu jedem anderen Lehrbuche der Naturgeschichte brauchbar. ', (translation: Copper plate collection in particular for F.P. Wilmsens manual of natural history for the youth and their teachers, but also suitable for any other tutorial on natural history.) With an Introduction by Dr. H. Lichtenstein and Dr. F. Klug, directors of zoological museums, etc., etc. In fifty pages. 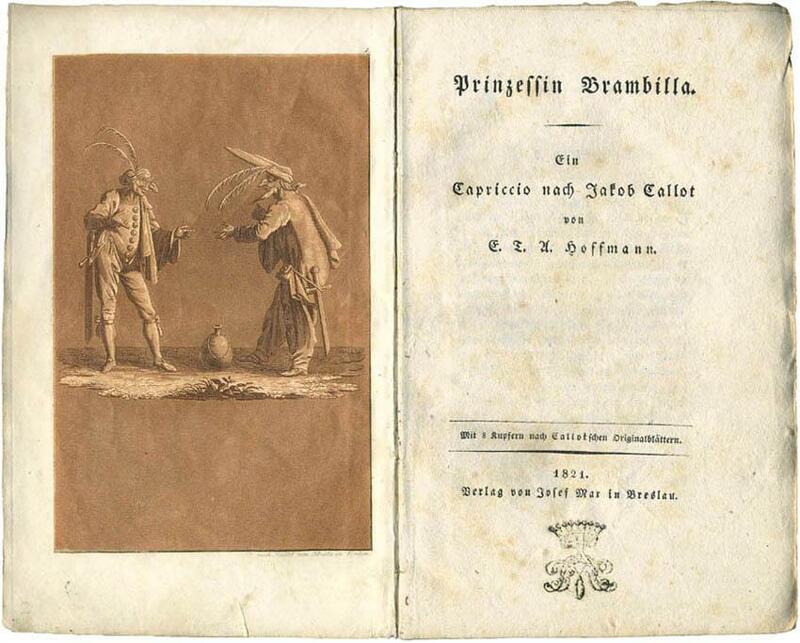 Published by Carl Friedrich Amelang, Berlin, 1821. These plates were designed to accompany 3 volumes of text. Scarse!Artists and Engravers: Friedrich Philipp Wilmsen (Magdeburg 1770-1831 Berlin) was a German reformed theologian and educator. The plates were designed after nature by Bressing, Ludwig Meyer, Muller and Weber, and engraved by Bressing, Guimpel, Meno haas, Friedrich Wilhelm Meyer, Ludwig Meyer, Tissot and Wachsmann. This plate by Bressing after Ludwig Meyer. Condition: Good. General age related toning and light staining. This plate with light thumbing, particularly in lower margins. Two very small tears in top and bottom margin not affecting image. Please study scan carefully. Storage location: A231-05 The overall size is ca. 12.2 x 9.3 inch. The image size is ca. 9.3 x 7.9 inch. The overall size is ca. 31 x 23.5 cm. The image size is ca. 23.5 x 20 cm. 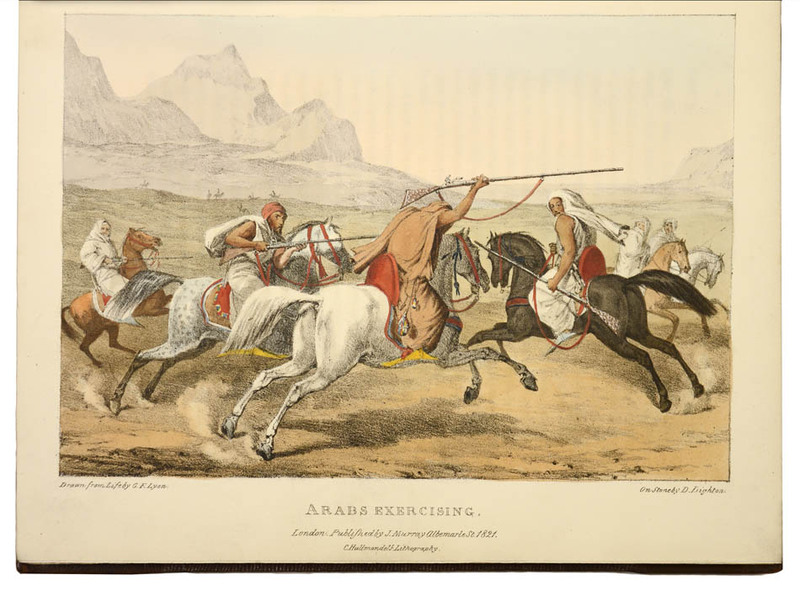 A narrative of travels in Northern Africa, in the years 1818, 19, and 20; accompanied by geographical notices of Soudan, and of the course of the Niger. With a chart of the routes, and a variety of coloured plates, illustrative of the costumes of the several natives of Northern Africa. 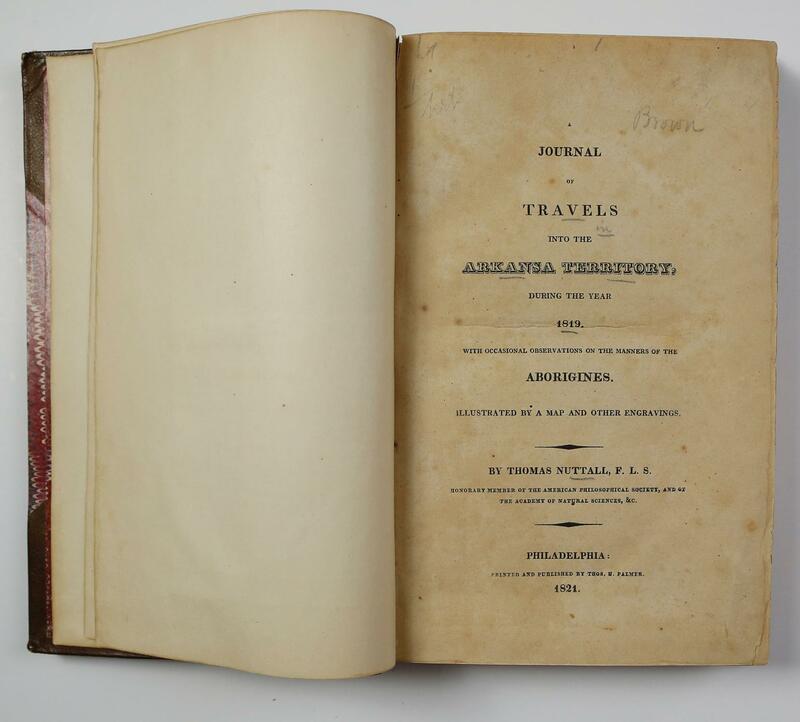 A Journal of Travels into the Arkansa Territory, During the Year 1819. Das Schloss und die Stadt Salzburg". Alkolorierte Umrissradierung von Carl Rahl nach Carl L. Fr. Viehbeck. Aus: Ansichten von Ob. Oesterreich, Salzburg und Tyrol von Carl Viehbeck. Radstadt am Tauern, gezeichnet am Wege nach der Rossbrand Alpe auf dem Schwemberg". Alkolorierte Umrissradierung von Erhard und A. Klein nach Carl L. Fr. Viehbeck. Aus: Ansichten von Ob. Oesterreich, Salzburg und Tyrol von Carl Viehbeck. Paris: Treuttel et Würtz, 1821-1844. First Edition. 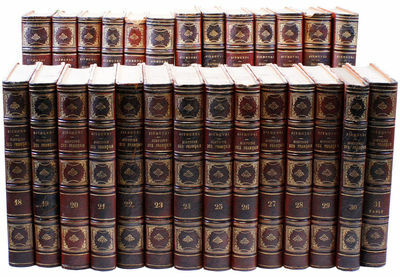 31 volumes; octavo (20.75cm. 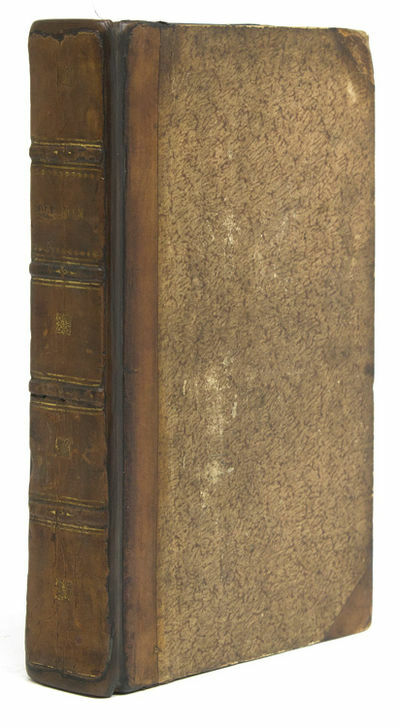 ); contemporary red morocco-backed boards, elaborate gilt spines in five compartments, marbled endpapers. 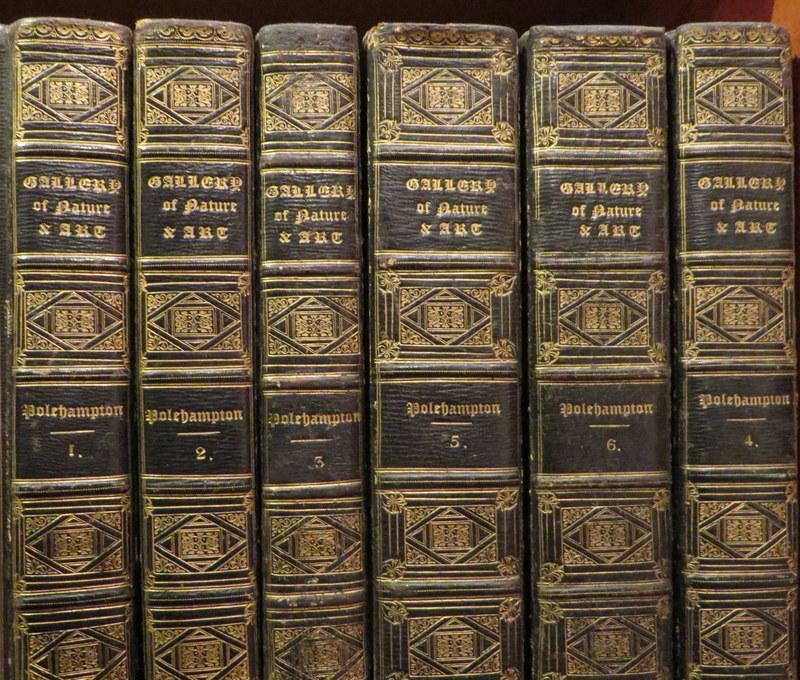 Spine leather uniformly darkened and rather brittle, general edge wear to extremities with some exposure, small losses at spine crowns to a few volumes, occasional foxing to textblocks, else a Very Good, complete set. Considered to be the Swiss economist and historian's most important work. Vols. 30 and 31 were published posthumously, completed by the French historian Amédée Renée. Provenance: Thomas Jefferson Coolidge's set with his ownership bookplates to each front pastedown. Coolidge, great grandson of Thomas Jefferson, was the last American plenipotentiary to France, appointed by President Harrison in 1892. Sydney: 25 July 1821. Folio; manuscript in ink on vellum, 303 x 390 mm; in fine original condition, with suspended paper seal. A good, early grant by Macquarie as fifth governor, with the signatures of Charles Whelan as witness and Frederick Goulburn as Registrar. Of special interest is the signature of the second witness: Hector Macquarie, the governor's nephew, affectionately known to his uncle as the "Hero Hector". This land grant dates from just after the period when Hector accompanied Macquarie and his wife on their official tour of Tasmania.By this grant Nathan Elliott received seven hundred acres of land in the district of Jarvis, Van Diemens Land, on the Strathallan Creek. The area, which became known as Tea Tree Brush, is to the north of Hobart between Brighton and Richmond. Here Elliott built an important early house, Strathallan, and the grant is today a heritage property at the centre of a working farm.This land grant is on vellum, with a good signature by the governor, and is complete with Macquarie's seal of the colony of New South Wales. When it was issued in 1821, Macquarie had already lost his fight against John Thomas Bigge, the royal commissioner and the man who forced his resignation as governor. History has treated Macquarie more fairly since: the colony can be seen to have enormously prospered under his leadership from 1810 to 1822, and it is now celebrated as the Age of Macquarie and the period when New South Wales found its independent entity.Nathan Elliott arrived as a free immigrant in Van Diemen's Land 11 October 1819 on the David Shaw (his fellow passengers on the voyage included Richard Read, headed for Sydney). 21 months later years Elliott was granted this large parcel of land to which he subsequently added by further grants. By April 1837, Elliott had 395 acres in the parish of Drummond, 736 acres in the parish of Jarvis and 10 acres at Brighton. He began construction of the Strathallan homestead in the 1830s, and it was completed by 1842. 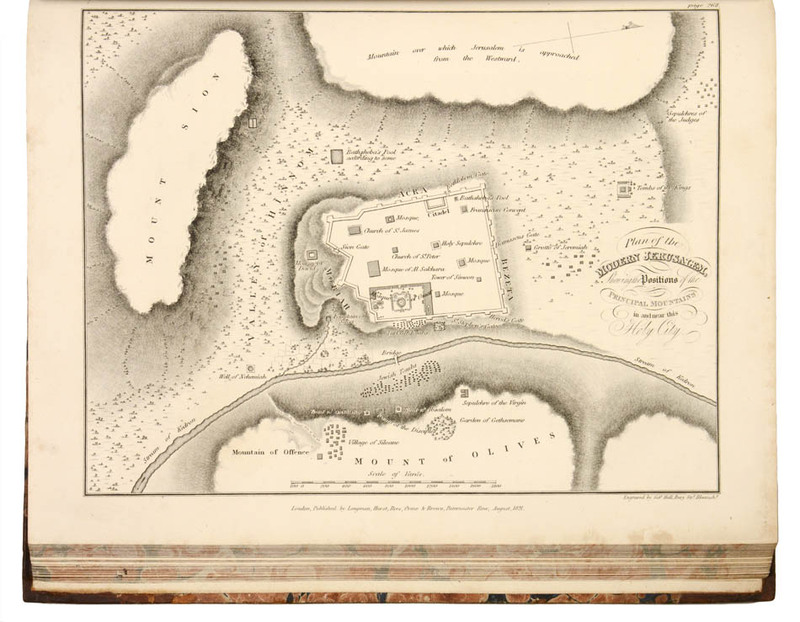 He further expanded the property by acquiring neighbouring land and by 1862 it comprised 1,130 acres. It was listed on the National Trust Tasmanian Heritage Register, which describes it as "Single storey stone house with hipped roof with boxed eaves and return verandah on three sides. The front has 3 bays separated by pilasters, a central 4-panel timber door with fanlight and half sidelights and large 12 pane windows either side. Includes stone barn and stables"
Reflksy golovnago mozga. Izdanie vtoroe. (In russischer Sprache: Die Reflexe des Hirns). 2. Auflage als Buch. II, 179 S.. 8. OBroschur. Broschur bestoßen, gerändert, mit Knickfalte und am Rücken mit Einriss nicht beschitten und nicht aufgeschnitten. Auf dem Innenspiegel mit dem Exlibris der Bibliothek Rudolf Virchow Virchow (1821-1902), Anthropologe und Mediziner, hat durch seine Arbeiten zur Zytologie nichts weniger als einen quasi kopernikanischen Paradigmenwechsel in der Medizin ausgelöst. Sechenov (1829-1905) hat auf seinem Studienaufenthalt 1856-59 in Deutschland (Berlin, Leipzig, Heidelberg) u. a. neben Helmholtz, Du Bois-Reymond auch Virchow kennen gelernt mit vorliegendem Werk wurde er zum Begründer der modernen russischen Physiologie. Das Werk selbst (EA 1866) war zunächst nach Erscheinen verboten, weil es als Angriff auf die öffentliche Moral empfunden wurde. Indem Sechenov auch 'höhere' Bewußtseinsprozesse strikt kausalistisch und naturalistisch auf materiale Ursachen im Organ des Hirns zurückführt, kann seine Arbeit als Versuch gewertet werden, 'Gott' oder außerhalb des biologischen Subjekts liegende letzte Ursachen für Bewußtseinsinhalte aus der Wissenschaft zu eskamotieren. London: Jones and Co., , 1821-2. or, the Rambles and Adventures of Bob Talyho, Esq. and His Cousin, the Hon. Tom. Dashall, through the Metropolis; Exhibiting a Living Picture of Fashionable Characters, Manners and Amusements in High and Low Life. By an Amateur. Embellished and Illustrated with a Series of Coloured Prints, Designed and Engraved by Messrs. Heath, Alken, Dighton, Rowlandson, &c. 2 volumes, octavo (280 x 130 mm). 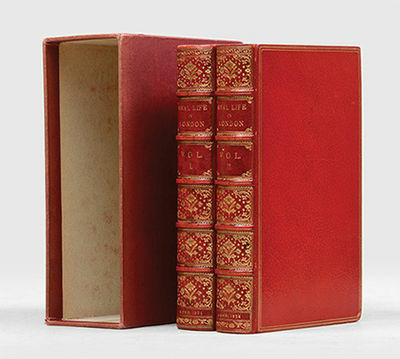 Bound around 1900 by Riviere and Son in red crushed morocco, lettered in gilt direct to spines with title, volume number and date, gilt floral decorations to compartments within five raised bands, gilt French fillets to covers, all edges gilt, green endpapers. Red slipcase. Illustrated frontispieces, engraved titles, 30 plates including the two additional plates which are generally present; all hand-coloured. The spine of volume II is incorrectly dated 1824. Pencilled addition to list of illustrations identifying the additional plates. Slipcase slightly rubbed and faded. An excellent set. 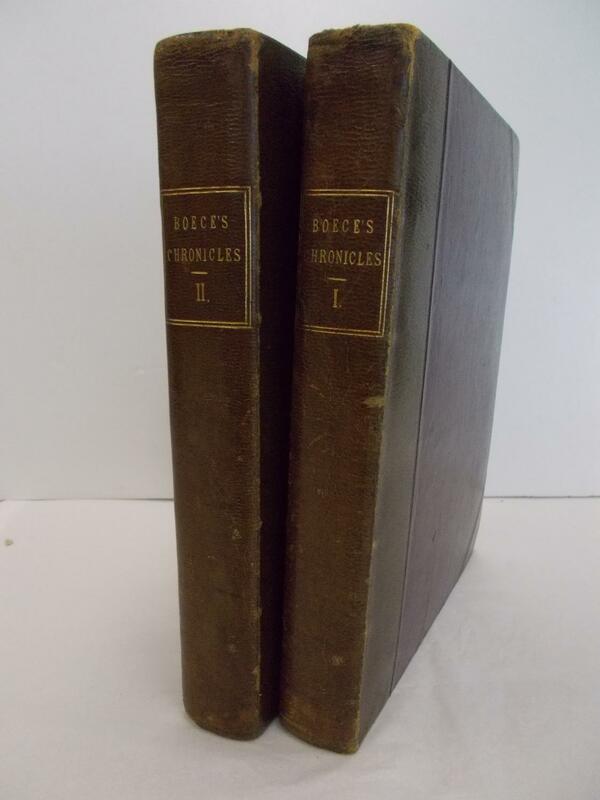 First edition, third issue of both volumes, with volume II bearing the false "1821" date (actually 1822) on title page. 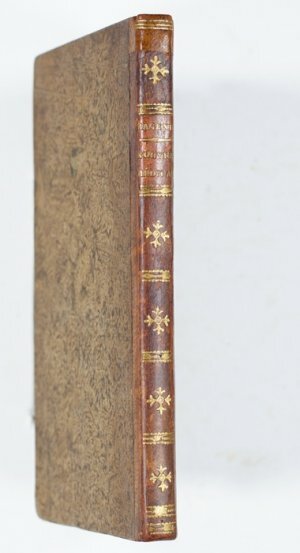 The incorrect 1824 date on Riviere's binding of volume II was due to the book being erroneously identified as the fifth issue. "An imitation of Egan's Life in London. Though not the equal of the latter, it has considerable merit, serves as a foil to its illustrious contemporary and is an interesting and useful guide to the social history of the period" (Tooley). 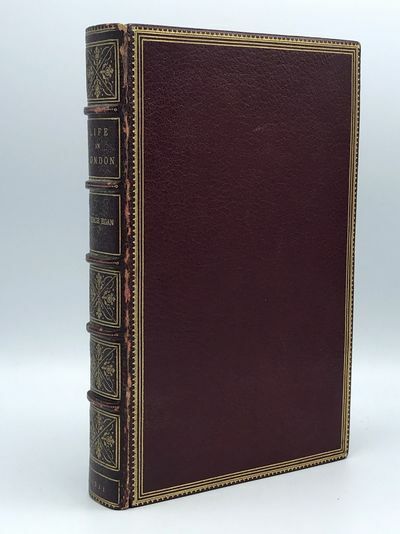 London: Shirley, Neely and Jones, 1821. Hardcover. Royal 8vo. xvi + 376 pp + frontispiece. Half-title. 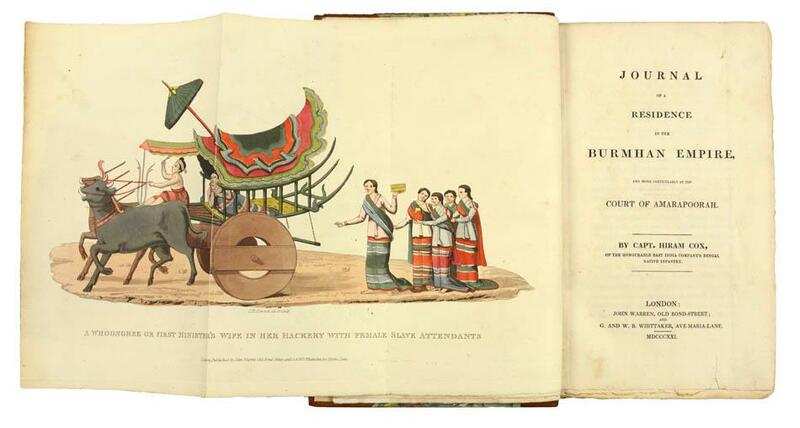 36 hand-colored aquatint plates by I. R. and George Cruikshank, with 3 pp folding sheets of songs. Crimson morocco by Zaehnsdorf, gilt-ruled on sides, gilt-decorated and lettered on spine, all edges gilt. Joints slightly rubbed; light offsetting of plates onto guards, occasional minor foxmark. 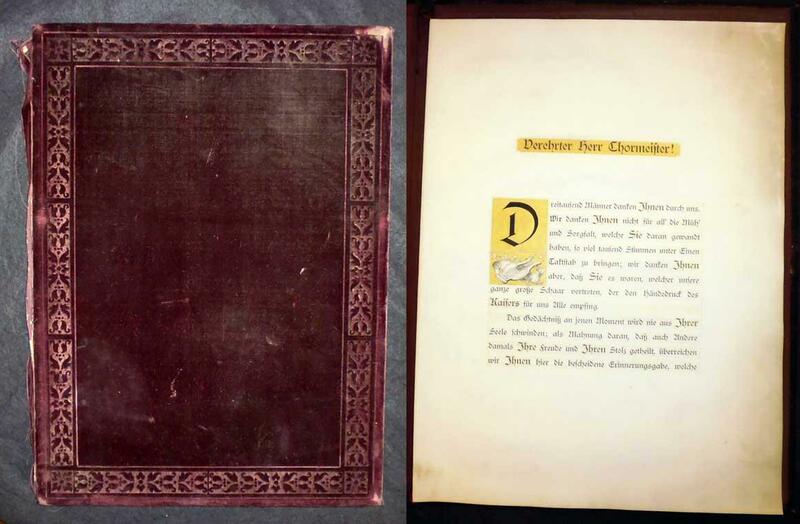 FIRST EDITION, second issue with the note on p. 9. Crosby Gaige's copy, with his bookplate. Anon. [Re: Sir William STRUTH (1763 - 1850)]. ST. VINCENT, WEST INDIES MSS. / SLAVERY / PLANTATIONS: "VIEW OF THE PROSPECT PLANTATION, THE PROPERTY OF SIR WILLIAM STRUTH ST. VINCENT WI 1821 TO SIR WILLIAM FROM AN OLD FRIEND IN S.V. - 25 JULY 1821." London: Shirley, Neely and Jones, 1821. Royal 8vo. xvi + 376 pp + frontispiece. Half-title. 36 hand-colored aquatint plates by I. R. and George Cruikshank, with 3 pp folding sheets of songs. Crimson morocco by Zaehnsdorf, gilt-ruled on sides, gilt-decorated and lettered on spine, all edges gilt. Joints slightly rubbed; light offsetting of plates onto guards, occasional minor foxmark. FIRST EDITION, second issue with the note on p. 9. Crosby Gaige's copy, with his bookplate. Oeuvres complètes, publiées par M. le baron de Staël, son petit-fils. UNTERHALTUNGEN AUS DER NATURGESCHICHTE des Planzenreichs. In 10 Bden. Prinzessin Brambilla. IV, 310 S., 1 Bl. Druckfehler, IV S. Anzeigen. Mit 8 Kupfern in Sepiamanier nach Callot'schen Orig.-Blättern (von C. F. Thiele). Hellbrauner bedruckter Orig.-Pappband mit farb. Rückenschild (Kanten und Kapitale leicht berieben). Classische und Topographische Reise durch Griechenland während der Jahre 1801, 1805 und 1806 - zwei Bände in drei von vier Büchern. Band 1 - erste Abteilung, Band 2. erste und zweite Abteilung. Engraved frontis. port. & six folding engraved plates. 2 p.l., vii, , 40, 256 pp. 8vo, cont. 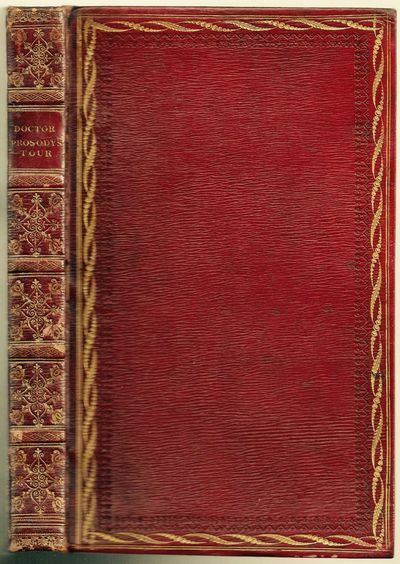 red straight-grained morocco (upper cover with small ink-stain, some foxing), panelled in gilt, outer border elaborately gilt, flat spine gilt, a.e.g. Besançon: Librairie de Deis, 1821. 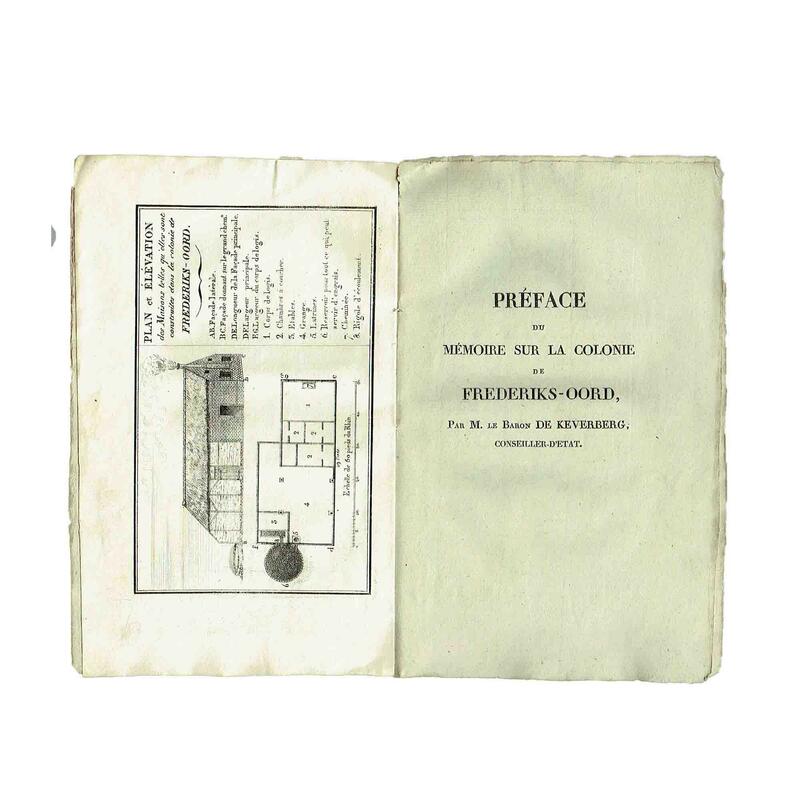 The catalogue of the library and collection of antiquities of Pierre-Adrien Pâris; the best professional library of the early 18th century. He bequeathed it to the city of Besançon. It contained a number of the essential books on architecture, about 1500 manuscript architectural designs by Pâris, and paintings and drawings by Fragonard, Boucher, and Saint-Aubin. Pâris (1745-1819), was architect to Louis XVI, designer of the royal cabinet, and directed royal festivities at Versailles, Marly, and Trianon. The collection reflects his deep appreciation for the classical architecture of Greece and Rome, where he journeyed several times. During these trips, he sketched buildings and artifacts found at Pompeii, Herculaneum, Paestum and other sites, which, along with other drawings, compose the 1500 architectural designs described here. These experiences prepared him to serve as director of the Académie de France in Rome under Napoleon, where he was responsible for excavations at the Colosseum. The library has considerable sections on architecture, history, the arts of antiquity, etc. The first 40 pages provide a biographical sketch of Pâris. Pages 1-146 enumerate 777 lots of books. Pages 147-222 contain a description of his cabinet (509 lots). The book concludes with an index of authors and artists. The engravings depict bronzes, terra cotta sculptures, marble statues, and other unique items in the collection. Nice copy, apart from the foxing. 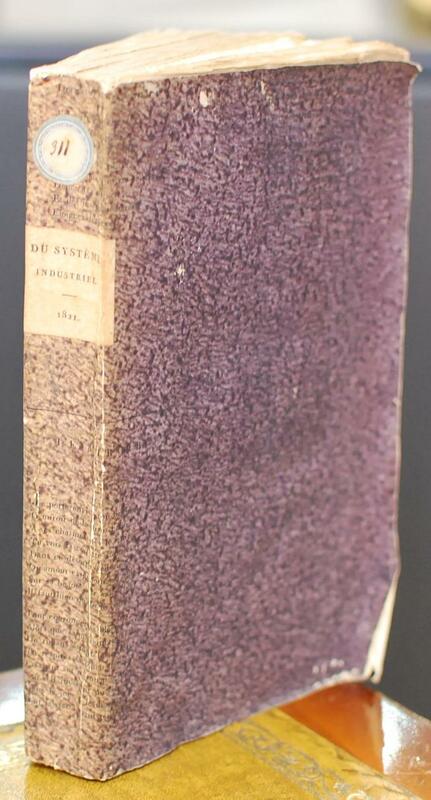 From the library of Bernard H. Breslauer (his sale Christie's NY, 22-23 March 2005, lot 660). &#10087; N.B.G., Vol. 39, cols. 209-10. A Visit to North America and the English settlements in Illinois, with a winter residence at Philadelphia; solely to ascertain the actual prospects of the emigrating agriculturist, mechanic, and commercial speculator. New York: Wiley & Halsted, 1821. First edition. 57, ; -63, ; -76; -64; -106; -156 pp, lacking section titles. 8vo. Contemporary half calf and marbled boards. Rebacked, preserving original spine, heavy spotting and foxing. First edition. 57, ; -63, ; -76; -64; -106; -156 pp, lacking section titles. 8vo. Francis Jeffrey's Copy. 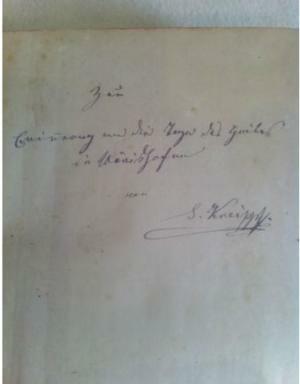 Inscribed on verso of front free endpaper to the editor of the Edinburgh Review: "For Fra[ncis] Jeffrey Esq. In a mark of respect from a friend of the Author. Boston, April 1823"
Widmungsexemplar - Sebastian Kneipp - Goffine, Leonhard P.
Christkatholische Handpostille oder Unterrichts- und Erbauungsbuch, das ist: kurze Auslegung der sonn- und festtäglichen Episteln und Evangelien samt den daraus gezogenen Glaubens- und Sittenlehren. 660 Seiten mit einem Titelbild, Farbentitel un vielen Holzschnitten. 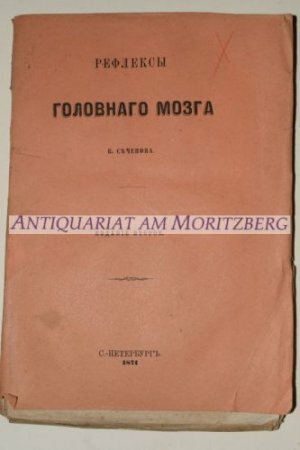 Gr.-8, gebundene Ausgabe, Original-Halb-Ledereinband mit goldenem Rückentitel und farbigem Buchschnitt mit Meß-Erklärung, Gebeten, einer Beschreibung von Jerusalem und Anhang von Alban Stolz, auf dem Vorsatz handschriftliche Widmung: "Zur/ Erinnerung an die Tage des Greules/ in Wörishofen/ von/ Sebastian Kneipp". Sebastian Anton Kneipp (* 17. Mai 1821 in Stephansried - + 17. Juni 1897 in Wörishofen) war ein bayerischer Priester und Hydrotherapeut. Er ist der Namensgeber der Kneipp-Medizin und der Wasserkur mit Wassertreten usw., die schon früher angewandt, aber durch ihn bekannt wurden. London: John Murray, 1821. sep 22 2017. 4to. xii, 132 pp. b/w engraved headers. 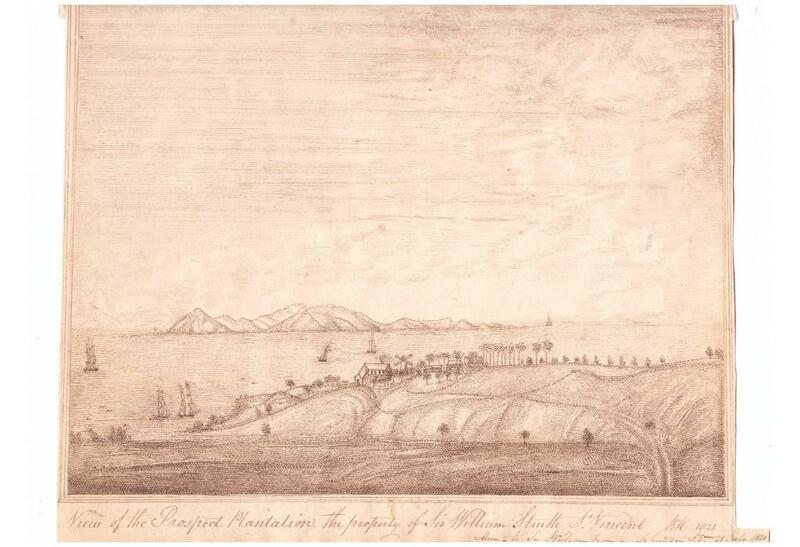 Written by members of the Parry Expedition, 1819-20, at their winter quarters... Melville Island, circulated there in manuscript and published after the expedition's return to London. Each issue contains verses, letters to the editor, reports on social activities in the camp, humorous articles, etc. - Arctic Bib. 12547. Inscribed by the author on half title, "William Petrie Crawfod Esq. with Capt. Parry's best regards." Sabine has also identified, in manuscript, the authors of five anonymous pieces. First edition. Very good condition, untrimmed. Rebound in full calf with spine label. 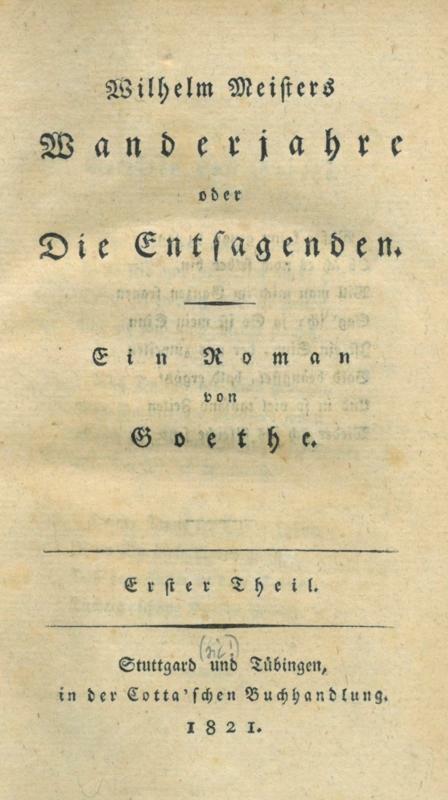 Goethe, Johann Wolfgang von. Wilhelm Meisters Wanderjahre oder Die Entsagenden. Ein Roman. Gedenkurkunde zum Österreichischen Sängerfest 1880 - Dank an den Chormeister. Gedenkurkunde, dat. 25. April 1880. An einen nicht genannten Chormeister [Franz Mair vom Wiener Schubertbund]. "Verehrter Herr Chormeister! Dreitausend Männer danken Ihnen durch uns. Wie danken Ihnen für all? die Müh? und Sorgfalt.." Signiert vom "Fünfer-Comité der Gesangvereine Wiens und Umgebung". 2 S. Pergamenturkunde in Zierschrift, Überschrift und Initiale goldfarben gehöht, 28,4 x 38,1 cm, in originaler weinroter Samtmappe mit Zierprägung (Buchbinder: A. Binder, Wien). Rücken eingerissen, Mappe bestoßen und beschabt, staubig. Franz Mair (1821-1893) war Komponist und Gründer sowie Chormeister des Wiener Schubertbundes. Von 1867 bis 1874 sowie von 1879 bis 1890 war er Bundeschormeister des N.Ö. Sängerbundes. - Das Österreichische Sängerfest vom April 1880 endete in einem feierlichen Festzug sowie einer Kaiserhuldigung in der Wiener Hofburg. Die Neue Freie Presse beschreibt den in der Urkunde erwähnten Moment des kaiserlichen Dankes an den Dirigenten wie folgt: "Nachdem die Sänger entsprechend postiert worden waren, begab sich Chormeister Franz Mair an das Dirigentenpult, welches in der Mitte eines von den Sängern gebildeten großen Kreises gegenüber dem Franzens-Monument errichtet war, und nun wurde von sämtlichen 2800 Sängern die Festhymne Sängergruß, deren Text Ferdinand von Saar gedichtet hatte, abgesungen. [...] Die Sänger, welche entblößten Hauptes ihre Ovation gebracht hatten, setzten auf besonderen Wunsch des Kaisers mit Rücksicht auf die glühenden Sonnenstrahlen ihre Hüte wieder auf. Auf eine Einladung des Kaisers begab sich das Festcomite in die kaiserlichen Appartements, und der Kaiser wiederholte demselben noch einmal seinen Dank für die gelungene Production. Der Monarch sagte zum Chormeister Mair: Ich bin angenehm überrascht, daß eine so präcise Aufführung bei einer so imposanten Sängerzahl möglich war." (NFP 26. 4. 1880, S. 3). Lit. : ÖBL 5 (1972) ÖML S. 1343. Paris, Levrault, 1821. In-8, demi veau blond, dos lisse orné. 2 ff.n.ch.- 319 pp. et 27 planches repliées. Rares rousseurs éparses sur le texte, sinon bel exemplaire. Edition originale de la traduction française par Max J. de Schauenburg, basée sur la deuxième édition allemande augmentée et revue, incluant 4 planches supplémentaires dessinées par Schauenburg. La première édition allemande parut en 1819. Wilhelm Meisters Wanderjahre oder Die Entsagenden. Ein Roman. Hemliga handlingar, hörande till Sveriges historia efter konung Gustaf III:s anträde till regeringen. (1)-3. - Stockholm, Ecksteinska tryckeriet, 1821-25. 8:o. (8),+ 270; (3),+ (blank),+ 280; (2),+ XXII,+ (7),+ (blank),+ 360 s. Genomgående lagerfläckig. Samtida hfrbd med guldornerade ryggar, blåa stänksnitt. Tre volymer. L. F. Rääfs exlibris. Setterwall 3334. Ovanlig och, enligt Bring, viktig urkundspublikation. Behandlar revolutionen 1772, finska kriget 1788-90, Anjalaförbundet samt riksdagen 1789. Andra delen innehåller även Gustav III:s dagbok från riksdagen i Gävle 1792 m.m. Tredje delen med separat extratitel: ?Handlingar till historien om revolutionen i Sverige 1772 .?. 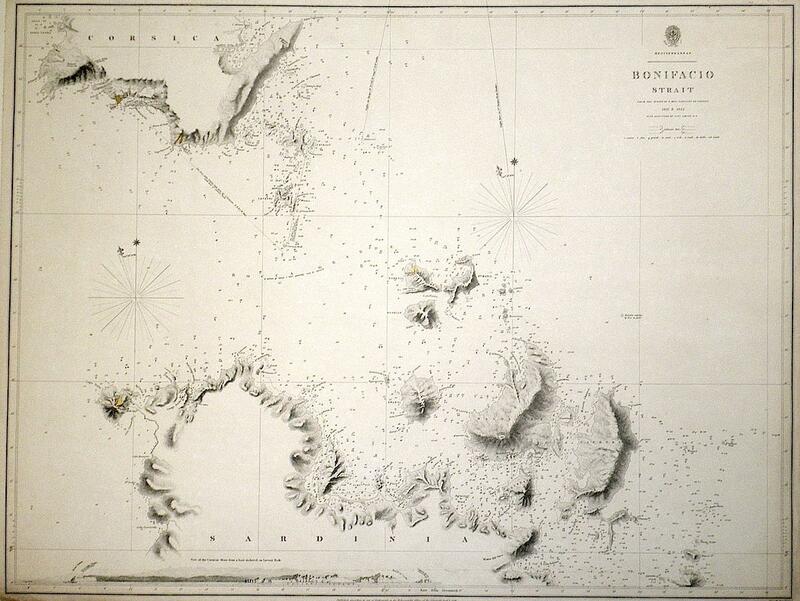 Londra 1821 - Incisione in rame di mm 485x635, tratta dall'opera "The Hydography of Sicily and Malta". Bell'esemplare montato su tela. cartografia. Gedenkurkunde zum Österreichischen Sängerfest 1880 - Dank an den Chormeister. Gedenkurkunde, dat. 25. April 1880. An einen nicht genannten Chormeister [Franz Mair vom Wiener Schubertbund]. "Verehrter Herr Chormeister! Dreitausend Männer danken Ihnen durch uns. Wie danken Ihnen für all? die Müh? und Sorgfalt." Signiert vom "Fünfer-Comité der Gesangvereine Wiens und Umgebung". - Franz Mair (1821-1893) war Komponist und Gründer sowie Chormeister des Wiener Schubertbundes. Von 1867 bis 1874 sowie von 1879 bis 1890 war er Bundeschormeister des N.Ö. Sängerbundes. - Das Österreichische Sängerfest vom April 1880 endete in einem feierlichen Festzug sowie einer Kaiserhuldigung in der Wiener Hofburg. Die Neue Freie Presse beschreibt den in der Urkunde erwähnten Moment des kaiserlichen Dankes an den Dirigenten wie folgt: "Nachdem die Sänger entsprechend postiert worden waren, begab sich Chormeister Franz Mair an das Dirigentenpult, welches in der Mitte eines von den Sängern gebildeten großen Kreises gegenüber dem Franzens-Monument errichtet war, und nun wurde von sämtlichen 2800 Sängern die Festhymne `Sängergruß`, deren Text Ferdinand von Saar gedichtet hatte, abgesungen. [.] Die Sänger, welche entblößten Hauptes ihre Ovation gebracht hatten, setzten auf besonderen Wunsch des Kaisers mit Rücksicht auf die glühenden Sonnenstrahlen ihre Hüte wieder auf. Auf eine Einladung des Kaisers begab sich das Festcomite in die kaiserlichen Appartements, und der Kaiser wiederholte demselben noch einmal seinen Dank für die gelungene Production. Der Monarch sagte zum Chormeister Mair: `Ich bin angenehm überrascht, daß eine so präcise Aufführung bei einer so imposanten Sängerzahl möglich war`." (NFP 26. 4. 1880, S. 3). Lit. : ÖBL 5 (1972); ÖML S. 1343. 2 S. Pergamenturkunde in Zierschrift, Überschrift und Initiale goldfarben gehöht, 28,4 x 38,1 cm, in originaler weinroter Samtmappe mit Zierprägung (Buchbinder: A. Binder, Wien). Rücken eingerissen, Mappe bestoßen und beschabt, staubig. Bologna: Nobili, 1821 8vo (209x144 mm); contemporary wrappers (small losses to the spine); (2), XVI, 134, (2 blank) pp. A nice copy. Uncut.SECOND AUGMENTED EDITION. 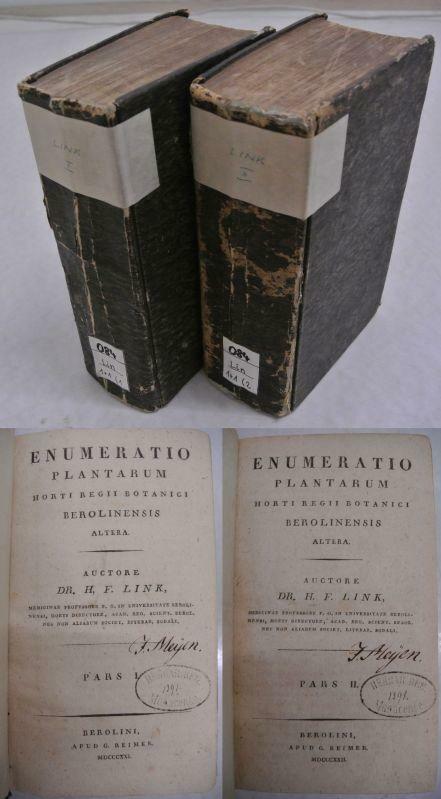 Before the title-page is a Notice (not described in ICCU) which mentions the first edition printed in Rimini in 1813. The name of the author is given only under the form of an anagram, Giri di Luna, in the dedication at p. III.This work by the canon from Savignano Luigi Nardi, though written as a "cicalata" (entertaining ludic poem) for the marriage of Carlo Ridolfi from Verona to Madonna Rosa Spina from Rimini, represents a real treatise on the history and art of making the porchetta (roast pork). According to Nardi, the only true porchetta is that traditionally made in Romagna, the author's region, which has nothing to do with that produced in Naples or Bologna. Nardi then refers that in the ancient Rome cuisine with "porcus troianus" was meant a pork stuffed with various meats, which once on the table was opened, often in a spectacular way, to release the precious content, as in the famous Homeric episode of the Trojan horse (cf. L. Bartolotti, La porchetta, sapori di storia e di tradizione, in: "Porcus troianus: la storia della porchetta in un trattato dell'Ottocento", facsimile reprint of the present edition, Rimini, 2006).Catalogo unico, IT\ICCU\SBLE\006492; B.I.N.G., 1338; Westbury, p. 158. Berlin 1821-1825. Erstes - Viertes Heft in einem Buch. Späteres (schlichtes aber hochwertiges) Bibl.-HalbLn, viii, 110 100 111 149 Seiten + 8 Stellungskarten. Einband gut, Papier gewellt, teils etwas braunfleckig, zum Teil Eintragungen mit Blei, ansonsten gutes Exemplar. POLEHAMPTON, E & GOOD, J.M. Johannes VAN DEN BOSCH, Count; Karel Lodewijk VAN KEVERBERG VAN KESSEL (Charles-Louis-Guillaume-Joseph KEVERBERG DE KESSEL, Baron de): De la colonie de Frederiks-Oord et des moyens de subvenir aux besoins de l'indigence par les défrichement des terres vagues et incultes. [From the colony of Frederiks-Oord and the means of providing maintencance of the poor by the reclamation of fallow and uncultivated land]. With 2 lithographic plates. Gand [Gent]: J.-N. Houdin 1821. In-8°. Pages [I-V], VI-IXXII (i.e. LXXII)], [2 (capiton leaf)], , 2-110, [2 (errata leaf); 2 lithographic plates. Contemporary thread stiched brochure with dark brown cover paper. 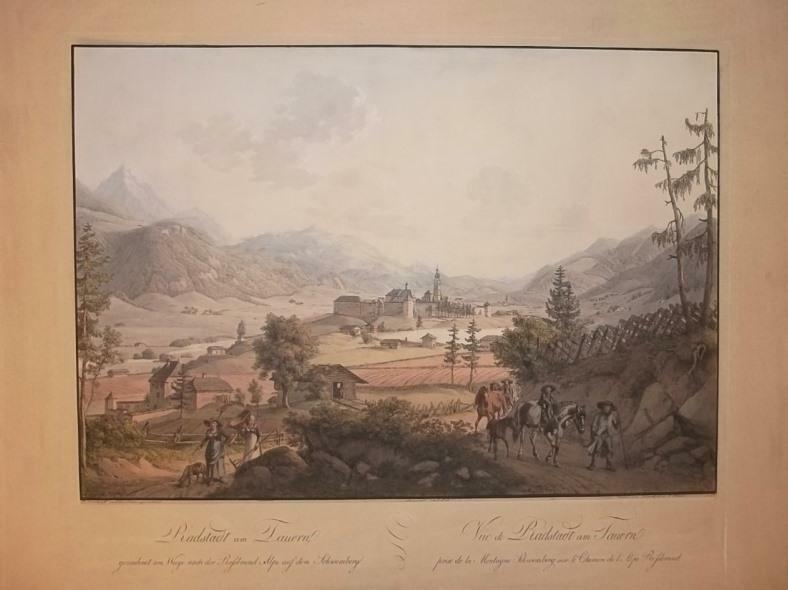 First and only contemporary description of the Netherland's oldest colony of benevolence, enriched by two lithographic plates, the one showing a ground plot and view of a colonist's house, the other a panorama of the main street of this facility. Preceded 1st edition of this important work was published in a French version written by Dutch government administrator and social reformer Karel Lodewijk Keverberg Van Kessel and is based on the original Dutch manuscript of the projects main political architect, Johannes Van den Bosch (1780-1844), a high ranking military officer and later Governor of the Dutch East Indies. Keverberg also added a lengthy preface and notes to Bosch's manuscript. Founded in 1818, Frederiksoord, near Zwolle in the Drenthe province, was a prototype free to enter and to leave agricultural colony projected for 1500 settlers and their families, the first of 3 such free (of totally 7) „Koloniën van Weldadigheid" (the others were Wilhelminaoord and Willemsoord) founded and funded by »The Society of Benevolence«, a trust of enlightened nobles, high officials and businessmen with philantrophic, macroeconomic impetus, patronised by Prince William Frederick (who also gave Frederiksoord it's name). The expressed goal of the colonies was to provide impoverished people (of which many had drifted into unemployment, poverty, neglect and subsequently also crime during and after the Napoleonic Wars) with employment and education, therefore offering tools for maintenance as well as for social and economic reintegration. Evaluations on the founder's intentions nowadays differ. Whereas some praise them as the creators of one of the most remarkable social experiments, based on 19th century Utopian thinking on the social order, others stress that they basically wanted to clean land for future profits on a large scale, by the means of exploiting labour and accompanied by social segregation, humiliating surveillance as well as correction and punishment. According to a contemporary articel in the Brockhaus encyclopedia the settlers had to be disciplined, clean and thrifty, otherwise their salaries and even natural produce was retained. „Still, being a Lowlands pauper just after the Napoleonic wars can't have been much of a picnic. Federiksoord was, to be fair, less punitive than the younger colonies at Veenhuizen where inmates were walled in to prevent escape but, looking at the dreary wastelands of Drenthe stretching out in every direction, it is hard to imagine where to escape to other than the bottle. Van den Bosch's record in introducing forced agriculture to the Dutch East Indies has won him few accolades from post-colonial historians but there is no doubt that his intentions here, while hardly charitable, do share some attributes of social reform with contemporaries like Robert Owen." (Cites with many thanks to Richard Neylon, ILAB). In Frederiksoord the »Society of Benevolence« today still has its offices. Furthermore, there is a guesthouse, a school of horticulture, and restaurated colony's cottages, in which the early colonists lived. The „Koloniën van Weldadigheid" are properties intended to consider for nomination for UNESCO World Heritage List. Although well available in institutional holdings this book is particularly hard to find. Cover strongly worn, edges and corners bumped, spine missing in bigger parts. Title page with four tenderly crossed letters, otherwise inside clean and with no stains. Brockhaus Conversations-Lexicon in 2 Bänden, vol. 1.2 (1828), p. 373; Biographisch woordenboek der Nederlanden, vol. 10 (1861) cit. WBIS/BAB 1.0370.006; Biographie nationale, ed. by the Belgian Royal Academie of Science, Literature and Arts, vol. 10 (1888-89) cit. cit. WBIS/BAB 1.0370.009. 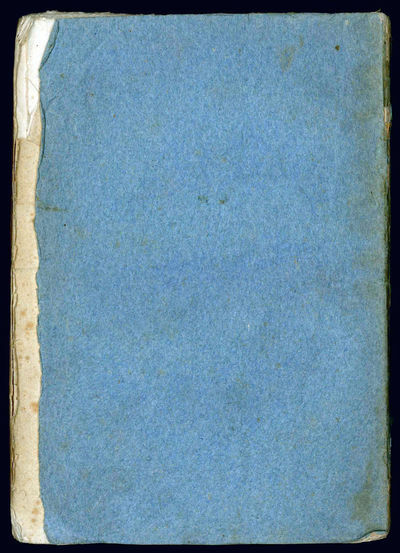 Journal of a Tour into the Interior of Missouri and Arkansaw From Potosi, or Mine & Burton, in Missouri Territory, in a South West Direction, toward the Rocky Mountains; Performed in the Years 1818 and 1819. 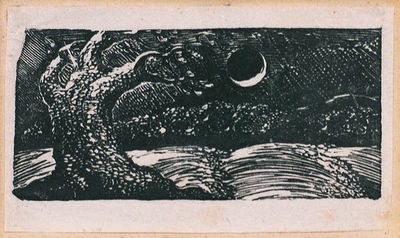 Wood engraving of a stormy night with a blasted tree (left) and a crescent moon (right), the sixth in his famous series of Virgil designs first published in Robert John Thornton, The Pastorals of Virgil (1821). 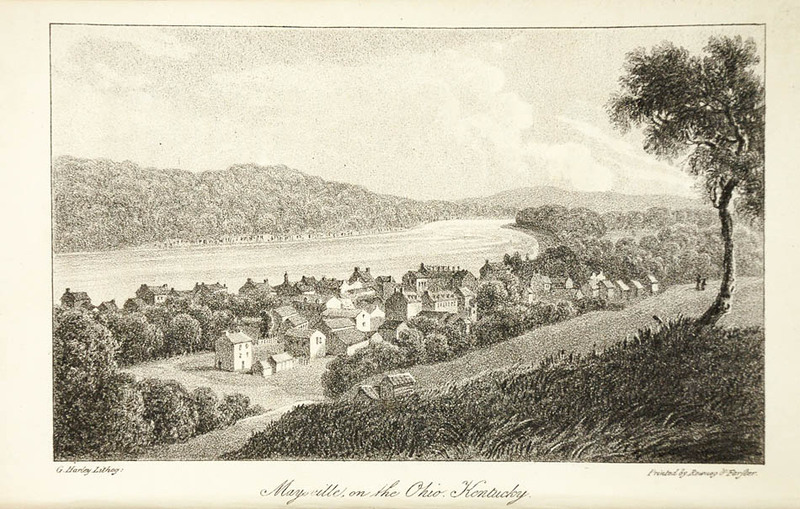 This impression printed no earlier than fall 1825 after John Linnell acquired the wood blocks. Single print on thin India paper, mounted, matted, and framed. London: 1821 (i.e. c. 1830s or later?). Single print on thin India paper, mounted and framed. Blake created 17 woodcuts for this volume (as well as 10 other plates, of which he engraved six) which were not well received; nor were they well treated by the publisher who cut down the blocks and printed them poorly. Only a few proofs before they were trimmed are now extant. These blocks have remained amongst the most influential woodcuts in the history of British art and their influence can be seen from Calvert and Palmer all the way up to the present day. The blocks were saved by Linnell and were printed not long after Blake's death as separate impressions (perhaps by Calvert), and again in 1977 as a set by Iain Bain. Any impressions are now very hard to find. Most Linnell impressions are darkly printed; some are over inked. This a good one.For a fuller discussion, see Essick's masterly monograph A Troubled Paradise... (San Francisco: John Windle, 1999). Bentley, Blake Books, 504. Bindman 602-18. Easson and Essick I, X. "They are visions of little dells and nooks and corners of paradise, models of the exquisitest pitch of intense poetry... such a mystic and dreamy glimmer as penetrates the inmost soul" Samuel Palmer. London: Henry Colburn and Co. Public Library, Conduit Street, Hanover Square, 1821. 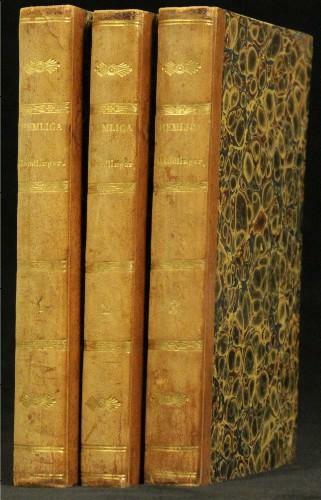 First Printing of the author's rare first novel (very rare, as here, in the British edition), complete in three volumes. 12mo: ,307,; ,301,; ,315,pp, vol. III, pp. 139 and 272 misnumbered 189 and 172). Contemporary half leather, marbled paper-covered boards, spines decorated in blind with gilt bands and lettering, blue marbled end papers, bookbinder's ticket on front paste down of vol. I (Hays, Book-Binder, 7. Richmond-street, Derry). An excellent set, with tight bindings (barely scuffed) and generally clean, bright pages. BAL 3825 (oddly, making only passing reference to this edition, although the Standard Novels edition [London, 1839] is given an entry of its own [BAL 3889]). Spiller & Blackburn, p. 18-19. ¶ Revision of first New York edition, "made apparently by the proof-reader and not by the author." (Spiller & Blackburn) Cooper wrote Precaution on a dare. Warren Walker (James Fenimore Cooper: An Introduction and Interpretation) records it this way: "In the customary practice of the day he was reading aloud to his wife one evening from a current English novel, but found the story dull. Throwing it aside, he declared, 'I could write a better book than that myself.'" To make good his boast, Cooper wrote Precaution, in imitation of contemporary English domestic novels, such as those of Jane Austen and Amelia Opie. In fact, when the novel appeared anonymously in New York (and later, London), it was credited to an English woman. The publisher, A. T. Goodrich, later surprised the public when it revealed that Precaution was authored by a gentleman from New York. N. B. With few exceptions (always identified), we only stock books in exceptional condition. All orders are packaged with care and posted promptly. Satisfaction guaranteed. Fine. Formulaire pour la préparation et l'emploi de plusiweurs nouveaux médicamens, tels que la noix vomique, la miorphine, l'acide Preussique, la strychine, la vératbine, les asalcalis des quinquinas, etc.